I have attended 5678 dance for 11 years and I have to say that it has become my second home. I have grown not only as a dancer but as a person here. When I'm at the studio I feel happy, confident, and I feel like I belong. The teachers are amazing role models. They are patient and kind and their main goal is to help you reach your full potential. The owner, who is also one of the dance instructors, Miss Jen, is a wonderful person who will give you opportunity after opportunity and she treats all of her students with love and respect. You will never feel unwelcomed or over-looked. There is no negativity, only positive reinforcements.Being a student at 5678 dance has helped me gain more confidence and every year, my dance skills would improve drastically. I guarantee you if you send your child here, they will have the time of their life. I know I did and I love dance so much because of this amazing studio. 5678 Dance has been a second home to my daughters for the past 5 years. Miss Jen and her staff provide a positive, nurturing and motivating learning environment with a family atmosphere for their students to develop their talents and self-confidence. The studio has provided my daughters with a high level of dance and opportunities to gain wonderful friendship. The teachers are patient, energetic and terrific role models for my girls. They encourage students to learn and grow as confident dancers while instilling valuable qualities of teamwork, responsibility, hard work and dedication. Through dance, my daughters have learned to be poised, confident and graceful children. Miss Jen and 5678 Dance develop special connections with their students and inspire young dancers to excel not only in dance, but also in life. I first walked through the doors of 5678 Dance in the Summer of 2006. Upon being warmly welcomed by both Miss Jennifer and Ms. Marilyn, i knew i would love being a student here. Miss Jenn gave me the chance to be on her competition team, and with that i was given the opportunity to perform and compete in numerous venues throughout the United States. As a student for five years, i developed a passion and commitment for dancing, as well as knowing what it meant to work hard and see the results that can come from it. In 2011, after my first full year of living in New York City, practically living at Broadway Dance Center (because i couldn't live without some sort of dancing week to week) while being a full time student, I was asked if i would like to teach a class for the summer program. I was beyond ecstatic for the opportunity, and three summer programs and three recitals later i am still part of this ever growing family that i love beyond words. I pass down to my students not only fabulous dance technique that i have learned over the years, but many of the life and learning lessons that Miss Jenn has passed down to me. Miss Jenn has also instilled her passion for the visual arts in me through her AMAZING choreography and i am beyond grateful for it. This is something that i carry with me everyday as i am studying fine and visual arts in college and something i will continue to work with and pass on to my students here at the greatest studio around, 5678 Dance. 10 years ago, my daughter was 5-years old and had been dancing for 3 years. She had to be persuaded every recital to go on stage and often cried when bringing her to class. By chance, while picking up pizza one night, I heard the music coming from 5678 Dance and was drawn to the studio. I remember standing in the lobby area and watching the teen-age dancers in amazement. Their energy, dedication, talent, skill and the unique and original choreography compelled me to sign up my daughter immediately hoping some day she would be one of those committed, talented dancers. 10 years later I am happy to say that little girl who wouldn’t go on stage her first dance recital is now one of those dancers and I am her proud mother. Within two months of joining 5678, Erin danced at Radio City Music Hall during a Lady Liberty Game with those same teen-age girls I had watched in the studio. Not once in her 10 years at 5678 has she complained about going to dance, even though she’s there almost every day, and we all know how difficult teenagers can be. 5678 is her second home and Ms. Jen is her second Mom for not only are the girls taught to dance, time is taken to teach the students to be ladies with values and respect for themselves and others which is something they don’t get outside of their homes. Jen and Marilyn truly care about the students’ well-being both in and outside of the studio. This time and care given to each student is apparent in the spectacular recital every year in which every dance is unique and every dancer knows their routine. In closing, I would like to give a sincere thank you to Ms. Jen, Ms. Marilyn and the other teachers at 5678 Dance for all you have contributed to the special person my daughter is today. We love being part of the 5678 Dance family and can’t imagine life without it! My daughter is an only child. We signed her up for dance to try to bring her out of her shell, as well as develop relationships with other children her age. Nikki was quiet, shy and very reserved when she came to 5678 Dance 5 years ago. From the very first combo class she has blossomed into a social and confident little person. 5678 Dance does more than just teach the kids choreography. Miss Jenn, Ms. Marilyn and their staff also teach their students how to be warm and giving members of society. A kind word, a smile, or a hug is sometimes the thing that brightens up someone's day. When Nikki joined the competition team the first thing Miss Jenn said to the team was; "You are all sisters...you have to look after each other and support one another. We're more than just a team, we are a family." Nikki came home that day and just glowed..."Miss Jenn said I have sisters now...19 of them!!" That was the moment that my 'only child' felt like she had love, not only inside of our home, but outside of it as well. 5678 Dance is the best decision I could have made as a parent. I know when she's there she has teachers, student teachers, the seniors and friends who care for her and help her learn how to be a warm, patient and giving person. To be honest, Miss Jenn and Ms. Marilyn reminded ME of a few of those traits too. 5678 Dance is a family owned business, and it isn't just about dance, it's about being a part of the family. I have been a 5678 Dance Mom for the past 11 years. I remember being referred by a coworker Carolyn whose granddaughter was attending the studio. She was so passionate about the nuturing environment. Everyday Carolyn would tell me about how much she and her grandaughter loved the studio and the half-time performances at Madison Square Garden for the Knicks, Lady Liberty at Radio City, and the prestigious local and national competitions the company dance team would attend that were held throughout the country. I knew my child would thrive in a welcoming and loving environment that would challenge her to grow at a very young age. I took my daughter to 5678 Dance to inquire about the fall dance program and she was so excited. She felt at home and said "Mom I want to dance here." The life lesson that she has gained here at the studio in the past 11 years is priceless. Her first year, she was challenged to do a center, right and left split in order to attend a national competion in Myrtle Beach. At the age of 7 she took on the challenge and within 2 weeks she achieved the goal and was able to perform in her first national competition after less than 1 year at the studio. Life lesson from this challenge for my daughter is hard work and dedication pays off. My daughter spent an abundant amount of hours a week at the studio, learning new choreography and practicing. At age 11, she started student teaching while going to school and maintained her place on the honor role year after year. Student teaching gave her a life lesson on giving back to the community. 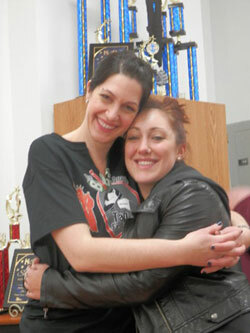 She was entrusted to mentor younger dancers... Jen and her staff teach the dance team to be the best they can be. We are so proud to be a part of the 5678 Dance school of the performing arts family. Miss Jen and her staff promotes team work among students as well as parents. In fact Miss Jens mom has given my daughter many inspiring conversations about college. Her mom and her fiance Dennis's mom helped get the ball rolling on a college that my daughter applied to. Miss Jen's mother also referred my daughter to a physical therapist office where she volunteers and is able to get experience in the field she will be going to college for as well as receive college credit. 5678 dance is built on a solid foundation. Family, love, respect, inspire, loyalty, commitment, honesty, team, 5678 Dance forever. I have be given the best opportunity, that has shaped my life forever, to dance at 5678 dance. With all the amazing instructors and people who belong to this studio, there is so much positivity and dreams being made that hopefully with the help of all these people, will one day be attained. I have danced here for 15 years and it will sadly be my last sweet 16 year this upcoming year. 5678 is not only a dance studio, it is a family and a second home, not only to me but to every person who walks through the doors. The staff as well as the families who belong to 5678, welcome everyone with open arms, accepting every newcomer, and wanting just as bad as the newcomer, to succeed. 5678 works as a team to move forward and accomplish more. Miss Jen, the owner and main instructor, has been there for me helping me push through every rough time because we are family and she cares so much about her families here at 5678. All in all, at the 5678 dance family miss Jen And ms Marilyn are second moms to everyone. They, as well as the other staff, encourage us to push forward to achieve no less then 110% of our best ability. I have grown throughout the years, not only as a dancer, but as a person expanding my social skills, especially since when I first joined. My first year at the studio I was 2 and I decided to hit miss Jen because she couldn't understand that I wanted my ponytail tightened, I was such a goon. I am now a confident young lady, who knows not to hit people, and I owe almost all of my success to 5678 dance. Four years ago my daughter told my husband and I that she wanted to dance. So as most moms do we got in the car and drove to the local dance studio called 5678 Dance. When we walked in and were greeted by Ms. Marilyn and within seconds Ms. Jen came out. Kennedi was signed up for a combo class and LOVED it! The recital came and I was so impressed with how great the show was. That summer Kennedi tried out for their competition team and has never looked back. We have tried other sports but each one lead to Kennedi doing some sort of dance move in the middle of the field or court! She loves dance and that is solely because of 5678! The staff, students and families of 5678 have been wonderful to not only Kennedi but to our family. My daughter attends dance almost 6 days a week and never complains. Because of Ms. Jen and Ms. Marilyn, Kennedi has learned to be supportive of others, learn from both successes and failures and develop a love of a sport that both her father and I never had at such a young age. I could never imagine Kennedi attending another dance school! We appreciate and admire Ms. Jen’s commitment and thank her and Ms. Marilyn for all they do for Kennedi and all the girls at 5678. As the unknown quote goes “Somewhere behind the athlete you’ve become and hours of practice and the coaches who have pushed you is a little girl who fell in love with dance and never looked back….dance for her.” Thank you Ms. Jen and the ENTIRE staff at 5678!!! I have attended 5678 for 8 years and it is truly a place that I call home. Jen and Marilyn are not only studio owners, But they are like second parents to every dancer that walks through their doors. Being apart of the studio and the competition team was truly a blessing; I was able to grow into the dancer I always dreamed of being. My first year at this studio I was given the chance to dance with the company members at Madison Square Garden during the Knicks halftime show; it was truly an experience of a lifetime. Jen and Marilyn are constantly trying to find new ways to help all of their dancers grow, at this studio you will always be pushed past what you think you can do because Jen never let's her students settle. Being apart of this team you learn the true meaning of loyalty, everyone has each other's back and we 150% always have Jen and Marilyn's. Once you become apart of this amazing family at 5678 you will never want to leave. I can honestly say leaving all my girls at this studio was one of the hardest things I have ever had to do; each and every dancer here becomes more than your teammate but your sister. Going away to school made me appreciate everything Jen and Marilyn have given me, the memories I have here will be with me for the rest of my life. At my school we have a dance team and a dance company, it was really nerve-racking dancing In front so many dancers who I didn't know when I didn't have one friend with me, but I was able to push myself to go to every audition because I knew Jen and Marilyn gave me a great education of dance which helped me make it on both teams. They not only teach you to want to see yourself improve but to want the same for your teammates. There is nothing I love more than coming home from school and watching how much the girls have grown since I have been gone. My love and passion for dance grows more and more every time I step into this studio, I owe all of my success to Jen and Marilyn and I cannot thank them enough for everything they have done for me. My name is Juliette and I have been in 5678 Dance for 8 years. All those years at this dance school has been very fun and I learned a lot. All of the teachers have been very kind and helpful and they all care about their students like Miss Jen, Miss Melissa, Miss Caitlin, Miss Stephanie, Miss Amanda and Mouse. 5678 Dance has always been like a second family to me. I am happy that my mom was able to take me to this dance school. Miss Jen and Ms Marilyn have always cared about us and always would tell you to work hard and what ever your goals that you have you can achieve. I will be with 5678 Dance until I become a senior and graduate. Until then I will enjoy my years with 5678 Dance. When my daughter started dancing at 5678 she was 4 and she had no rhythm. My family watched her dance at family gatherings and would jokingly ask how much I as was paying for dance lessons. She loved dance and music and kept working at it. The owners/instructors at 5678 were equally dedicated to working with her. They helped her find her rhythm and build her dance skills one class at a time. Fast forward 11 years and my daughter is on the senior competition team and achieving top awards at regional and national dance competitions. It is amazing to have witnessed the transformation and I tremble with excitement when I watch her on stage. This amazing journey has not been all about the dance and competitions. Miss Jen and Ms. Marilyn lead the school with strong family and team values. They care about the health and well-being of each and every student. They never miss an opportunity for a teaching moment – whether it be about dance, health, friendship, community or historical figures and events. And while they are serious about dance, they also enjoy and encourage having fun and plenty of laughter. My daughter has learned so much more than dance at 5678. I am equally excited to see her laughing uncontrollably with her dance team or watching her and her teammates help and support one another. I am grateful that she is part of the 5678 dance family and comforted in knowing that she spends her time in a wonderful environment that shares our family values.